Hey gang...Travis back with some cool Tampa Bay entertainment news! You can join Tops In Blue as they present “To Dream,” an action-packed adventure of music and dance that invites audiences to follow their dreams, whatever they may be. Tops In Blue, the premiere entertainment showcase of the U. S. Air Force, will perform at the Ford Amphitheatre on November 2 at 7pm. The gates open at 6:30pm and both the show and parking are FREE – No tickets are needed. This year, Tops In Blue continues its long-standing tradition of “family entertaining family” by showing us what has made Tops In Blue a “must-see” event every year for over half a century. You’ll hear hot Latin sounds, All-American country music, and hits from the top of the charts. You’ll experience the great music from your favorite movies and Broadway shows. Combine all that with the dazzling lights, costumes and precision choreography for which Tops In Blue is known worldwide, and you can look forward to a show that’s sure to please everyone. 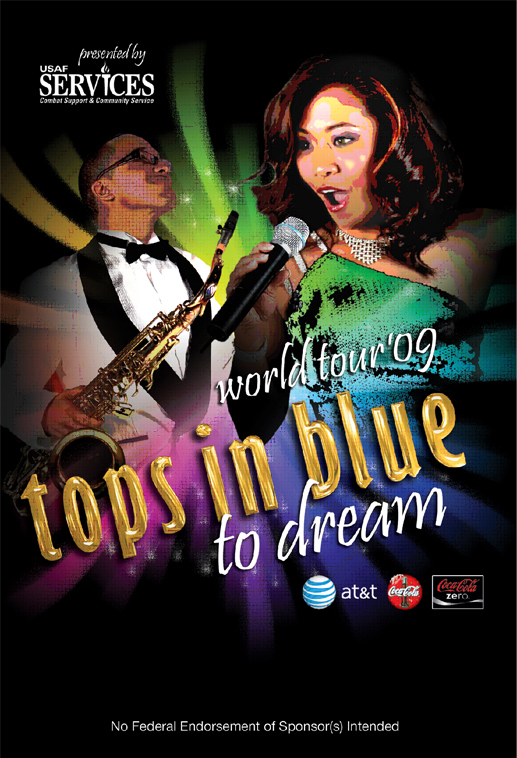 Tops In Blue ‘09 keeps 56 years of touring tradition by visiting all bases throughout the United States and more than 25 foreign countries. Their aggressive tour schedule spans more than 120 locations and also includes entertaining forward-deployed troops in various locations in Iraq, Qatar, Afghanistan and Kuwait. The show is guaranteed to energize hearts and souls and remind each of us that we stand proudly for America, its people and its music. So, don&apos;t miss this powerful and unforgettable show. if you need more details, just visit www.topsinblue.com. And as always, keep checking back here for more great Tampa Bay area events and information about great things to do in Tampa Bay.